Gopāla - Tāpanīya Upanishad - one of the original Atharva Veda Upanishads, which describes the transcendental form and pastimes of Lord Krishna. 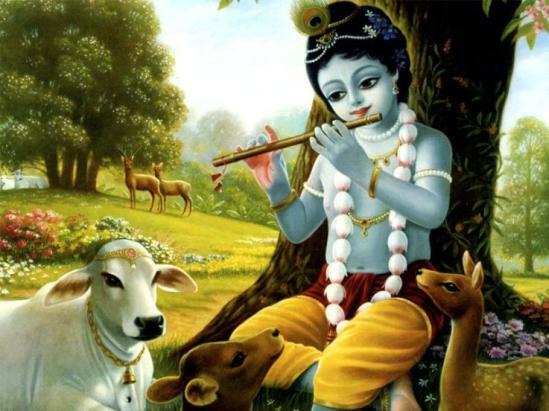 'Gopāla' is one of Krishna's names - meaning "the small shepherd" - and it usually refers to Lord Krishna as a small boy while he was living in Vrindāvan, tending cows, playing his flute and teaching his friends – other little cowherds and cowherdesses – gopas and gopis. Gopāla - Tāpanīya Upanishad also covers how to meditate and worship Lord Gopāla, and which mantra to use best. May the all-knowing Sun [Sūrya] bless us! May Garuda, the thunderbolt against evil, bless us! Om namaḥ. I offer my respectful obeisances to Śrī Krishna, whose form is eternal and full of knowledge and bliss, who is the rescuer from distress, who is understood by Vedanta [philosophy], who is the supreme spiritual master, and who is the witness in everyone’s heart. I glorify the Gopāla-Tāpanī Upaniṣad. showering the nectar of the Supreme Lord's spiritual form, it delights the devotees. I offer my respectful obeisances unto the Gopāla-Tāpanī Upaniṣad, which is part of the Atharva Veda, and which describes the transcendental form and pastimes of Lord Krishna. I offer my respectful obeisances to Lord Krishna, whom the Sāma Upanishad and Śrīmad-Bhāgavatam proclaim the Supreme Personality of Godhead. "The word kṛṣ is the attractive feature of the Lord's existence, and ṇa means spiritual pleasure. When the verb kṛṣ is added to affix ṇa, it becomes "Kṛṣṇa ", which indicates the Absolute Truth." Lord Krishna's mercy is described in the word "aklita-karine", which means that the Lord rescues the living entities from the five-fold miseries of material existence, and also that the Lord is so kind that He even liberated those demons fortunate enough to be personally killed by Him. The word "Vedānta-vedyaya" means that Lord Krishna may be understood only by following the instructions of the Vedas, which lead the follower to liberation. Other so-called spiritual paths will not help one become liberated. The word "gurave" means that the Lord becomes the teacher who enlightens His devotees. The Lord does this by appearing as the Super-soul (buddhi-saksine) in everyone's heart. "Become My devotee, accept Me as your spiritual master, come to Me and worship Me." May our heart eternally rest on Govinda, who is full of bliss, the master of unlimited inconceivable transcendental potencies, the witness of everything, the expert protector of the devotees, and the creator of the material world! I glorify the Gopāla-Tāpanī Upaniṣad, which to the pious reveals Lord Krishna, the original Personality of Godhead, the Super-soul near to all moving and unmoving creatures. "O Arjuna, because My complexion is blackish, I am known as Krishna." "Who is the Supreme Personality of Godhead? Whom does death fear? By knowing whom does everything else become known? Who created this world?" The sages here are the Four Kumāras. They phrased their questions in such a way as to elicit the eighteen-syllable Gayatri mantra as their father's reply. The syllable OṀ is used here, as it is generally used in the Vedic hymns, to invoke auspiciousness. The Kumāra’s first question is "Who is the supremely opulent and worshipable Personality of Godhead, than whom no one is greater or equal?" The subsequent questions all relate to the qualities of the Supreme Person. "Krishna is the Supreme Personality of Godhead. Death fears Govinda. By understanding Gopījana-Vallabhāya everything becomes known. By pronouncing the word “Svāhā” the Personality of Godhead created the world." The statement that death fears Govinda means that Krishna rescues the living entities from the hands of death. The name Gopījana-Vallabha means "Krishna, who is very dear to the gopis." "The Supreme Personality of Godhead can be understood only by devotional service." By answering the Kumāras' question in this way, Brahma initiated them in the chanting of the eighteen-syllable Gāyatrī mantra. "Who is Krishna? Who is Govinda? Who is Gopījana-Vallabhāya? What is Svāhā?" The sages asked these questions to elicit from Brahma a more elaborate description of Lord Krishna's qualities. "Krishna means He who delivers from sin. Govinda [another name for Krishna] means He who is famous on the earth, in the Vedas, and among the Surabhī cows. Gopījana-Vallabhāya [another name for Krishna] means He who enchants the gopis, and Svāhā means the potency of the Supreme. All these names refer to the Supreme Personality of Godhead. Supreme Person who liberated Pūtanā, Agha, Keśī and many other demons killed by Him. The name Govinda means the Supreme Lord who is famous to the Surabhi cows of Vraja. He is glorified in the verses of the Vedas, and He is famous on the earth because He removed the burden of demoniac kings. Govinda also means He who protects the cows, land and Vedas. Lord Govinda is the Supreme protector, who rescues the living entities from the hands of death. Gopījana-Vallabha means He who enchants the gopis, who are all manifestations of His hlādinī potency. Then Lord enchants them with the sweetness His handsomeness and other transcendental qualities, removes their materialism, and grants them ecstatic love for Him. In this way He has become very dear (Vallabha) to them. The name Svāhā means the Lord's potency by which everything is manifested. "For they who chant the auspicious holy name of Krishna, millions of grievous sinful reactions become immediately burned to ashes." "One who chants” Krishna, Krishna, Krishna" at the time of death becomes eligible for liberation." "I worship the Personality of Godhead, Govinda, who, by expansion of His internal potency of transcendental existence, knowledge and bliss, enjoys in His own and expanded forms. "The gopis are expansions of My own internal potency." "Lord Krishna appeared very glorious in the association of the gopis." "The sages say that Lord Viṣṇu is the master of all transcendental potencies." "One who meditates on this Supreme Personality of Godhead, glorifies Him, and worships Him, becomes liberated. He becomes liberated." Liberation means freedom from the cycle of birth and death and eternal association with Lord Krishna. In this text the goal of life is described: By meditating on, glorifying and worshipping Lord Krishna, one becomes liberated. "What is His form? What is His glorification? How does one worship Him? Please describe this to us." "He appears like a cowherd boy. His complexion is like a monsoon cloud. He stays under a desire-tree. The following verses describe Him. "Meditating with all his heart on Lord Krishna, whose eyes are handsome lotus flowers, whose complexion is a monsoon cloud, whose garments are lightning, who has two arms, who is rich in transcendental knowledge, who wears a garland of forest flowers, who is the supreme controller, who is surrounded by gopas, gopis, and surabhi cows, who rests under a sura-druma tree, who is decorated with splendid ornaments, who stands in the middle of a red lotus flower, and who is served by breezes that have touched the Yamuna’s waves, a person becomes free from repeated birth and death. "By chanting these five names one attains the Supreme Personality of Godhead, whose potencies are manifested as the heavenly planets, the earth, sun, moon, and fire. "A person who even once chants the mantra 'Klīm Kṛṣṇāya Govindāya Gopījana-Vallabhāya Svāhā' quickly attains the association of Lord Krishna. He does not attain any other result. "Devotional service to Lord Krishna is performed when the heart no longer desires any material benefit to be obtained in this life or the next. This is freedom from the bonds of karma. "Pure devotional service to Lord Hari is actual liberation." "One should be free from all material designations, and cleansed of all material contamination. He should be restored to his pure identity, in which he engages his senses in the service of the proprietor of the senses. This is called devotional service. 1. hearing the Lord's glories, 2. reciting the Lord's glories, 3. remembering the Lord constantly, 4. serving the lotus feet of the Lord, 5. worshipping the Lord, 6. chanting prayers to the Lord, 7. carrying out the orders of the Lord, 8. making friends with the Lord, and 9. surrendering everything to the Lord. As a result of engaging in Lord Krishna's service, one develops intense ecstatic love for Him. This is described in the Eleventh Canto of Śrīmad-Bhāgavatam. "As one becomes advanced in devotional service to the Lord, he becomes ecstatic. The hairs of his body stand on end, and he manifests ecstatic symptoms." "Many brāhmaṇas [priests] worship Krishna. Many worship eternal Govinda. Gopījana-Vallabhāya maintains the worlds. Powerful Svāhā moves the universe. Many brāhmaṇas, following the path of the Śāstras, worship Krishna. Many others, following of the path of spontaneous love as the residents of Gokula followed it, worship Lord Govinda, the hero of Gokula. "Although originally one, air becomes the five life-airs [Tattva] in the bodies of all living entities. In the same way, for the benefit of the world Lord Krishna appears as these five words." "Please describe the worship of Govinda, the Super-soul, who maintains everything." "The Lord’s altar should be a golden lotus with eight petals. Within that lotus should be placed two triangles and the mantra Klīm Kṛṣṇāya namaḥ, the Kāma-Gāyatrī (Klīm Kṛṣṇāya Govindāya Gopījana-Vallabhāya Svāhā), and the Anangā-Gāyatrī (kamadevaya sarva-jana-priyaya sarva-jana-sammohanaya jvala jvala prajvala prajvala sarva-janasya hrdayam me vasam kuru kuru Svāhā) should be written there. Then aṅga should be offered with the sula-matra (Astrāya Phaṭ). Then one should worship the Lord’s expansions, beginning with Rukmiṇī, the devotees headed by Indra, the devotees headed by King Vāsudeva, the devotees headed by Arjuna, and the devotees headed by Indra-nidhi. "O Nārada, placing the Lord on His altar, I worship Him with prayers, incense ,lamps, arghya and other gifts." "He who at sunrise, noon and sunset, makes various offerings to the Deity, obtains everything. He obtains everything. "Lord Krishna is the worshipable, all-pervading supreme controller, and although He is one, He manifests in many forms. They who are intelligent worship Him as He stands on His altar. They, and not others, attain eternal happiness. "Krishna is the original Personality of Godhead." "The brāhmaṇas [priests], who worship, as He stands on His altar, the one greatest among the eternals and greatest among conscious persons, the one who fulfils the desires of the many, they, and not others, attain perfection. "To them who always diligently worship Lord Viṣṇu’s transcendental form, the Lord, in His original form as a cowherd boy, shows His lotus feet. "The Personality of Godhead reveals Himself to His pure devotees." "It was Krishna who in the beginning instructed Brahma in Vedic knowledge and who disseminated Vedic knowledge in the past. They who desire liberation surrender to Him, the Supreme Personality of Godhead, who grants transcendental knowledge to His devotees. "To them who chant the five-word mantra with OṀ and Govinda (OṀ Kṛṣṇāya Govindāya Gopījana-Vallabhāya Svāhā) the Lord reveals His own form. Therefore, to attain transcendental peace, they who desire liberation should regularly chant this mantra. "From this five-word mantra have come all other Govinda-mantras in human society, including the ten-syllable Govinda-mantra chanted by Indra’s followers and by them who desire opulences." The persons desiring opulence in this verse are the four Kumāras - followers, who desire liberation, and Nārada’s followers, who desire pure devotional service. They asked: "Please tell us the nature of this mantra." "I continually glorified the Lord and meditated upon Him for millions of years, and at last I was able to understand the transcendental form of the Lord as Śrī Krishna, in the dress of a cowherd boy. With devotion in my heart I bowed down before Him. He gave me the eighteen-syllable mantra to be used for the activity of creation, and then He disappeared. "When I desired to create the universe He again appeared before me, showing me in these syllables the universe that was to be. "From the letter K, I created Water, from the letter L, Earth, from the letter Ī, Fire, from the letter M, the Moon, and from the entire word Klīm, the Sun. From the word Kṛṣṇāya, I created Ether, from Govindāya, Air, from Gopījana-Vallabhāya, Knowledge and the Surabhī cows, and from Svāhā, men, women, and everything else. "By worshipping Him, Shiva became free from illusion, and by chanting this mantra in a solitary place, he attained the Lord. "The devas gaze at Vishnu’s abode, which is like a splendid sun in the sky. "Therefore one should regularly chant this mantra. One should regularly chant this mantra. "Some have said that from the first word of this mantra Earth was created, from the second word Water, from the third Fire, from the fourth Air, and from the fifth Ether. To attain liberation one should chant this five-word Vaishnava mantra, which reveals Lord Krishna. "One should chant this mantra, of which from the first word the element earth came, from the second word water, from the third fire, from the fourth air, and from the fifth ether. "By chanting this mantra Shiva entered Lord Viṣṇu’s eternal spiritual abode. "That spiritual world, completely pure, uncontaminated, free from suffering, free from greed and all other vices, and identical with this five-word mantra, is manifested from Lord Vāsudeva [another name for Krishna]. It is not separate from Him. "With eloquent prayers I and the Maruts please Lord Govinda [another name for Krishna], whose form is eternal and full of knowledge and bliss, who stays under a desire tree in Vṛndāvana, and who is this five-word mantra. "Om namaḥ. To Lord Govinda, who is the form of the universe, the creator, maintainer, and destroyer of the universe, the master of the universe, and the universe itself. I offer my respectful obeisances. "Obeisances to Lord Govinda, whose form is full of knowledge, whose form is full of supreme bliss, who is all-attractive, and who is the master of the gopis. "Obeisances to Him, His eyes lotus flowers. Obeisances to Him, garlanded with lotuses. Obeisances to Him, His navel a lotus. Obeisances to Him, the husband of the goddesses of fortune. "Lord Govinda is served with great reverence by hundreds and thousands of gopis." "The damsels of Vṛndāvana, the gopis, are super goddesses of fortune." "Obeisances to Lord Govinda, handsome with a peacock-feather crown, identical with Balarāma, His intelligence sharp, and He the swan in the Manasā lake of the goddess of fortune’s thoughts. The goddess of fortune here is Śrīmatī Rādhārāṇī, who is described in the Puruṣa-bodhini Upaniṣad. "Candravali and Rādhikā always remain at Lord Krishna's side. Lakṣmī, Durgā, and the Lord's other potencies are expansions of Śrī Rādhikā." The transcendental goddess Śrīmatī Rādhārāṇī is the direct counterpart of Lord Śrī Krishna. She is the central figure for the goddess of fortune. She possesses all the attractiveness to attract the all-attractive Personality of Godhead. She is the primeval internal potency of the Lord. "Obeisances to Him, the death of Kamsa and his allies, the killer of Keśī and Cāṇūra, the object of worship for Śiva, and the chariot-driver of Arjuna. "Obeisances to Him, the cowherd boy fond of playing the flute, the crusher of Kāliya, the person who walks on the Yamuna’s shore and whose earrings gracefully swing to and fro. "Obeisances to Śrī Krishna, the protector of the surrendered souls. Obeisances to Him, the expert dancer garlanded with the gopi’s lotus glances. "Obeisances to Him, the death of sin, the lifter of Govardhana Hill, the end of Pūtanā’s life, the thief of Trnavarta’s life. "Obeisances to Śrī Krishna, decorated with a golden necklace, charming, pure, the enemy of impurity, one without a second, the greatest. The Word niskalaya may also mean "He who is beyond the influence of material illusion" and the word vimohaya may be interpreted to mean "He who is omniscient and cannot be put into illusion even by Brahma or Śiva". The word "asuddhi-vairine" may be interpreted to mean "He who removes material impurities from the hearts of those attached to hearing and chanting His glories." "Be kind, O blissful one. Be kind, O Supreme Lord. O Lord, please rescue me, bitten by the snake of physical and mental pain. Vyadhi, or physical pain, inevitably comes when one fulfils his material desires. When material desires remain unfulfilled, however, the conditioned soul experiences mental pain, or adhi. Either condition is inauspicious for the conditioned soul. "O Krishna, O husband of Rukmiṇī, O enchanter of the gopis, O master of the universe, please rescue me, drowning in the ocean of repeated birth and death. "O Keśava, O Nārāyaṇa, O Govinda, O Janārdana, O source of all transcendental bliss, O Lord who rescues the devotees from distress, O Mādhava, please rescue me." "Both Brahma (ka) and I (isa), the master of all living entities, were born from You, and for this reason, O Lord, You are known as Keśava." "As I worship Him, so should you. Chanting this five-word mantra, and meditating on Lord Krishna, you will transcend the world of birth and death. "One who chants this five-word mantra easily attains His transcendental abode. "Although fixed in His abode, the Personality of Godhead is swifter than the mind and can overcome all others running. Even the powerful devas cannot approach Him. "Therefore, Krishna is the Supreme Personality of Godhead. One should meditate upon Him, glorify Him, serve Him and worship Him. Om Tat Sat."